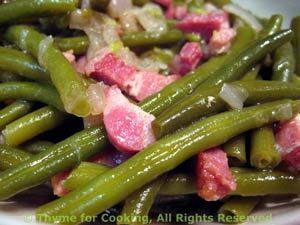 Green Beans with Prosciutto, Thyme for Cooking easy summer side dishes. Rather than sauté the Prosciutto, removing it and serving it crisp, we are cooking it with the beans. It may not look as pretty but the ham flavor slowly cooks into the beans for a more traditional, southern taste. Put beans into small skillet, add stock and Prosciutto, cover and simmer over medium heat until done, about 15 minutes. Uncover during last 5 minutes to cook off some of the cooking liquid.